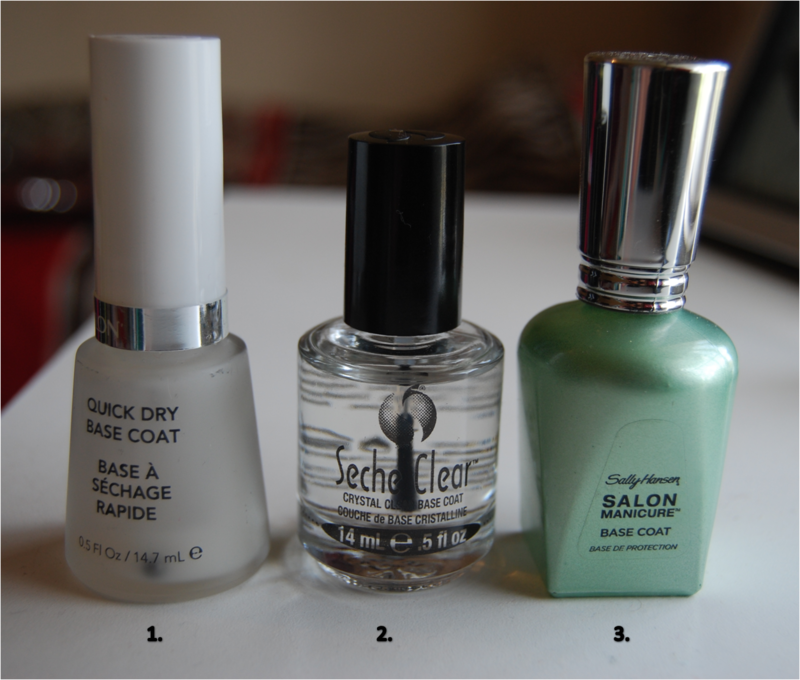 A lot of people have been asking lots of questions about what base and top coats I use, so considering I have many of each, I thought I would do a little blog review on the different products I own. So here are my many Base Coats. Base coats are really important because they sort of act like a glue between your nail and the polish, therefore helping the polish stay on longer and stops the polish staining your nails. It also smooths out the surface of your nail to make the polish glide on a little better. Now this is the first base coat I had ever bought and I feel in love instantly. Pros: The brush is a little wider like so there are less strokes. And it says what it does on the bottle, it dries super quick. I am an impatient person and to have the base coat dry so quickly helps a lot! I also liked how it was a little thicker so that the nail is really well protected and long lasting. It is also pretty cheap when you buy it off Ebay, I got this bottle for about about $7 including shipping. Cons: It does get really gunky after a while. The thickness does make it a little difficult to paint on. But in saying this, I had been using the bottle for over 5 months before I noticed a real different in consistently. It also can cost up to $15 from somewhere like Priceline. This is a Base Coat I bought by accident. I thought I was buying Seche Vite but alas, I ended up with this so I gave it a go. Pros: Super thin and leaves your nails really shiny. I don't know how important a shiny base coat is but it was really shiny. It is thin so it spreads quite thinly so that drying time in minimal too. :) And no stainage! Cons: I felt that this polish didn't actually smooth out the surface of my nail as well as the others. Also the brush is quick thin so you end up doing a few strokes which are a pain. I thought I would give Sally Hansen ago since it is so accessible at the shops around where I live. Pros: This product is pretty amazing. It has a large angled brush to glide over your nail easily, and usually takes one stroke. Its a little thicker so that the nail is actually protected by the polish, so no stains. It also leaves the nail smooth so your nail polish glides on perfectly. Cons: It is not the fastest drying base. I have only had it for a few weeks too so I don't know how the thickness will change over time. The other con this product has is the price... you are looking at about $16 at Priceline, cheaper at places like Big W or Target. Even though these all have different pros and cons I tend to use them all at different times. Depending on the design I am doing or the time I have to do it. Or even how long I'm going to wear it. If you want any more info about the products above feel free to leave me a comment below. Tomorrow I will be doing a similar review on Top Coats.